Linda has been in long term care for more than 25 years and has been a licensed Administrator for 20. She holds a Bachelor of Arts degree from Stonehill College and a Masters in Public Administration and Health Administration from Suffolk University. She holds a Geriatric Health Training Certificate from Boston University School of Public Health and a National Certification for Aging Service Professionals (CASP) from the University of North Texas, affiliated with LeadingAge. Linda is an active member of the American College of Health Care Administrators and serves on the Board of the Massachusetts Chapter. She began working in long term care at an early age when her mother was Director/Bookkeeper of The Doolittle Home. She was exposed to all facets of daily operations and she has worked in most positions, including a nursing assistant on each shift. Linda is very happy to return to her training ground and lead the team at The Doolittle Home. Linda supervises a staff of 40 and coordinates management of the facility. Roz began working at The Doolittle Home in August of 2001. She was a good fit in the Dietary Department with 30 years of experience in the food service industry. She quickly realized she enjoyed our residents and began to volunteer her time in the Recreation Department. Two years seemed to fly by as she grew to know our residents’ personal histories. Roz was readily accepted by all and gained the trust and confidence of our residents. When the Recreation Director position became open in January of 2004, Roz was offered the position and began to work on her national certification. Under the umbrella of the Recreation Department, Roz is our volunteer coordinator. She enjoys meeting people of all ages and guiding them through our volunteer program. Roz is our chapel coordinator and works closely with several local ministers to ensure that the spiritual needs of our residents are met. Roz belongs to the Attleboro Area Council of Activity Professionals and the Massachusetts Council of Activity Professionals. Lori has been cooking at the The Doolittle Home since 1993, but first heard about it from her father who serviced the piano at the home. She was quick to explain that it “feels more like a family than a job”. Lori enjoys getting to know each of the residents and she enjoys watching the young dining room staff interact with the residents. It is good for both the high school students and the residents. Compared to other facilities she has worked in, it is unique to have personal relationships with each student. Lori feels that “all staff truly care about the residents and the home. They are not just doing their job.” This leads to staff longevity which enables the residents to know the staff they interact with each day. Contrary to what some might believe, Lori explains that her cooking at the Home is quite varied. She reviews menus with the residents on a bi-monthly basis and incorporates their suggestions for new dishes. She also explained how individual needs are addressed to ensure the dining experience is positive for each resident. For those who may have difficulty cutting their meat, it is cut for them in the kitchen and served cut up so they can enjoy their meal without feeling embarrassed to ask for assistance or to struggle on their own. 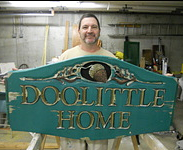 Philip has handled the maintenance responsibilities since January of 2000 at The Doolittle Home. The home keeps him busy and challenged along with giving his workday great variety. He is proud of the beautiful home he maintains for the residents. Phillip is not new to working with the elderly, having spent the prior 19 years in a nursing home environment. He enjoys getting to know the residents as he helps them by hanging a picture or shelf in their rooms. He describes the residents as alert, engaged, full of interesting stories and, of course, always happy to see him. While the residents are always polite, they do love to joke and tease him. Philip remembers the first time he visited The Doolittle Home. He was impressed by the dining room and seeing the residents all having dinner together. Unlike days at another facility when it could be hard to get up to go to work, he looks forward to coming to The Doolittle Home to see the residents and other staff members.